Supposedly, this is Neil Armstrong's 1967 Chevrolet Corvette. 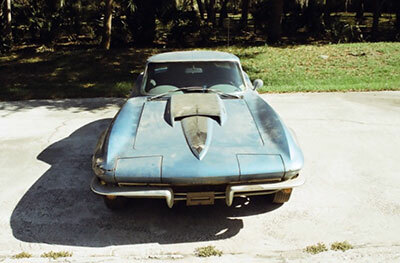 This is the ultimate Corvette "barn find". This corvette was delivered to Mr. Neil Armstrong, the first man on the moon, on December 15, 1966 from Jim Rathman Chevrolet in Melbourne, Florida under a program initiated by Mr. Rathman to provide our astronauts with a Corvette. They would keep the Corvette for a year and then turn it in and get a new one. 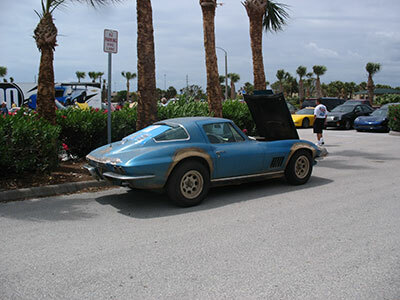 This Corvette was bought by a NASA employee when Mr. Armstrong turned it in and was retained by the owner until I purchased the corvette from him in February of 2012. The Corvette had been in a climate controlled environment and not driven since Sept. of 1981. I had tried to buy the Corvette for the past 30 years with no luck until a phone call led to the purchase recently. There have been six bids to date, bringing the total to $120,099, still under the reserve. 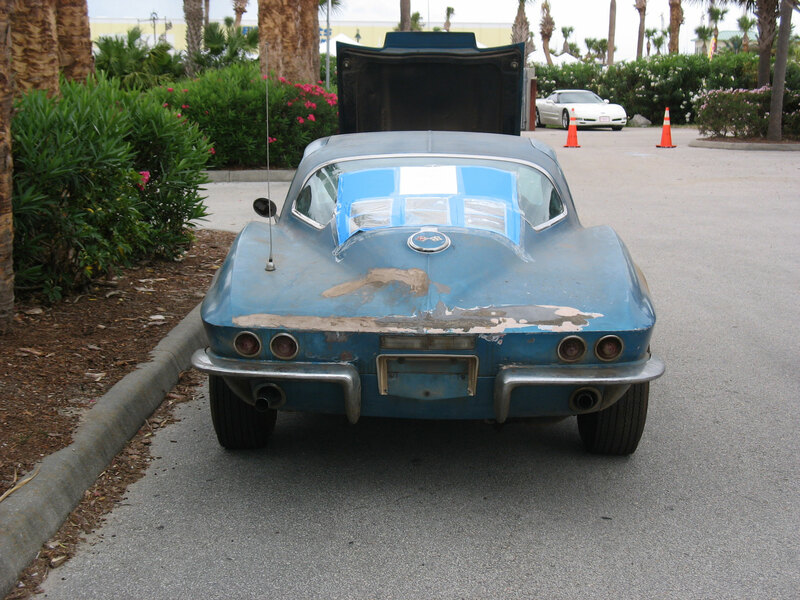 So, just out of curiosity's sake — are there photos showing Neil Armstrong ever owned a 1967 Corvette matching this model? I don't often enough check "Corvette Online" for space history information. But this article contains a good history of the astronauts' Corvettes program. Unfortunately, at least for this seller, it has a photo of a white Corvette of a different model described as Armstrong's. It was on display at a museum - the Cosmosphere? There are similar photos on Flickr. While I am not a Corvette aficionado, the one pictured in the museum is a 68 or later while the one on eBay is a 67. It is possible he had a 67 and turned it in at the end of his lease of one year and got a new 68. That would lead to the question of how many he had leased during his career. The seller should have at least washed it up a bit before taking the pictures. One way to prove ownership would be just go through the DMV and track down it registered owners to the car's VIN. Of course I'm sure these cars and their VINs were documented to owned or the car was leased too. As a vintage car collector myself, that is what I would be doing to verify the car's history. Here are some more photos on Neil's old Corvette. One of my employees just saw it at a car show in Florida. According to him the current owner has the title data that proves ownership by Neil. Well, whoever owned this car over the past 40 plus years surely didn't treat it well. This car will need a complete restoration to bring it back to life. To me that will take away from "survivor" fact and that Neil Armstrong owned it. Well, it does look like it's been to the moon. 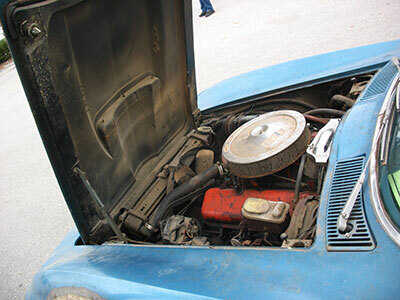 Gary - in the collector car world restoration is often seen as a plus as long as it's done with the original car in mind. That's to say if it's accurately restored to how it left the factory in 1968(9) it will not detract from the value. But if modern tires, brakes or other modifications are made, even in the name of safety, this will detract from the originality and hence value. Oh, Trust me I understand what a "correct" by the numbers, date coded everything means in a restoration. As a MOPAR fan and a current owner of a 1969 Dodge Charger and one token GM product, 1968 Olds Cutlass, value is held when done right. On the flip side of things, depending on how much restoration is required, say whole new interior, then the only original parts that Mr. Armstrong is associated with are the metal in the seat frame, steering column and wheel, dash, etc. I guess if you kept the "worn" out original seat covers, then you can say that Mr. Armstrong sat in these seats. Yes, the car will need some life brought back to it. It would be pretty cool to say that Neil Armstrong once owned the car that is now in your possession. I wouldn't walk away. I just love true survivors, the time capsules when you can find them. Bidding is up to $249,990.00 and the reserve has not yet been reached. This is getting interesting... and 3 days yet to go for this auction. That's a crazy bid for a vehicle in such poor condition, no matter who owned it. If the paperwork is authentic, as advertised, then the buyer can take that as evidence of his ownership. However, some interesting things I came across might raise some doubts. This website has stills from a film taken of the astronauts pulling up to MSC in various cars, including one vintage Corvette driven by Armstrong. Look at the 2:00-2:30 section of photos (they're copyrighted, so I didn't want to post them here). I'm not a Corvette expert, but the model year looks close. However, the hood is obviously different. This, of course, could have been replaced or modified throughout the years, but if no record exists, I would question it. The color is difficult to discern since it's a B&W film, but it is a lighter shade, perhaps silver or the royal blue of the offered car. There is a logo medallion on the left side forward of the driver's door that is not present on the auction car. But many other details look very similar, such as the rear window, the seam down the length of the roof, the bumper and grill. Another thing I thought I had read in First Man was that Armstrong did not recall having ever having owned a Corvette. I was unable to locate this reference in the index, but I may have read it elsewhere. I remembered his saying that when I found this film, but it is feasible that if he once took advantage of the Rathmann deal, it may have been for such a short period of time that it was not significant in his memory. I wish the buyer luck... by the time you're done with the time and expense of restoring it, there won't be much left original to the Armstrong period. And even at $250,000 the reserve has still not been met. Being a car nut and as I stated before, I would be running the history on the car's VIN and tracking down all documentation that proves Neil Armstrong owned / operated / leased this car. Second, be a bit of a Dukes of Hazzard nut, this reminds of a couple of years ago when actor John Schneider sold his "own built", NEVER used in the TV series 1979-85, but was used in the second (year 2000) Television Reunion, "Dukes go to Hollywood". That particular car made it near $10 million on eBay, only have it be some "clown" who was just bidding it up. John eventually sold it for close to $500k on Barritt-Jackson. Unfortunately, at least for this seller, it has a photo of a white Corvette of a different model described as Armstrong's. The car pictured is captioned incorrectly. That particular Corvette belonged to Alan Shepard and is displayed at the Apollo Saturn V Center at Kennedy Space Center. I'm not a Corvette expert, but the model year looks close. According to the website presenting the film, the footage is from 1965. Another thing I thought I had read in First Man was that Armstrong did not recall having ever having owned a Corvette. First Man makes specific reference to Armstrong's first Corvette leased to him as an astronaut being damaged in the fire that claimed his house. The auction failed to reach the reserve, despite attracting 73 bids and a final hammer price of $250,090. The Corvette failed to sell during the Ebay auction in May, with a high bid of $251,638.00 coming just short of the unpublished reserve, according to Crosby. He says he received calls from three of the bidders within an hour of the announcement of Armstrong's death, but that the offers still aren't quite where he wants them. Crosby hasn't raised his original target price, despite the newfound significance of the car. ...Crosby isn't planning to put it back on Ebay, but he's listed in the phonebook and ready to listen to any serious offers. Hemmings Motor News reports that Neil Armstrong's Corvette is heading toward preservation. As for authenticating the Corvette as Armstrong's, Rathmann did keep files on all of his astronaut cars, but subsequent owners of the dealership destroyed those records. Still, Armstrong's name appears on the Protect-O-Plate, and Crosby convinced Jack Legere, a friend of his who works at NASA, to show Armstrong Crosby's photos of the Corvette during one of Armstrong's periodic visits to Florida. "He immediately recalled it and grinned ear to ear," Crosby said. "He didn't have time then to check it out in person, and we all know what happened next." Armstrong died in late August at the age of 82. 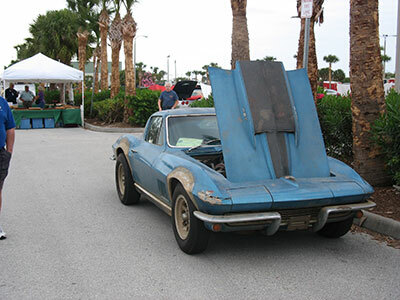 Up until this summer, Crosby intended to subject the Corvette to a full restoration, as he had with all of his other Corvettes, but then mid-year expert David Burroughs, a champion of original and preserved cars, convinced him to call preservationist Eric Gill of nearby Port Orange, Florida. Like Burroughs, Gill prefers preservation over restoration, particularly when it comes to cars with provenance, such as the Neil Armstrong Corvette. "Preservation is the cutting edge in the hobby right now," Gill said. "The term is deceptive because some people think it just means sitting on the car, but we're actually developing protocols for retaining the history of a car, as opposed to wiping away all that history in a restoration. A historically significant car is only as interesting as the people who gave it that history." 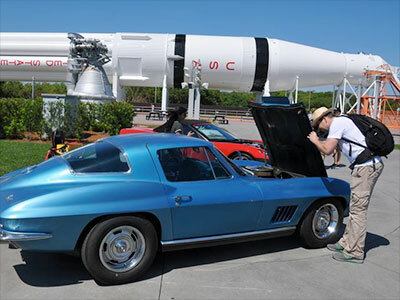 Florida Today reports that Merritt Island resident Joe Crosby displayed Neil Armstrong's 1967 Corvette Sting Ray in the Rocket Garden at the Kennedy Space Center Visitor Complex today (April 9). Crosby, a retired Brevard County Sheriff's Office west precinct commander, bought the car from an undisclosed Georgia owner in February 2012. He initially offered the vehicle on eBay — where it garnered offers exceeding $250,000. Instead, he decided to keep Armstrong's Corvette and restore it. Indeed, that's a beauty again!!! Looks like a fine effort at restoring and preserving the car. Looking at the whole photo, that's a great lineup of American power, whether on the ground or in space.